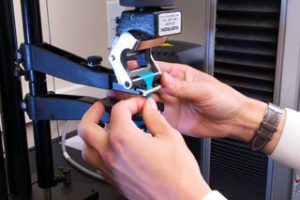 The Tear Resistance test measures the force required to tear a sample material such as woven or nonwoven fabrics, and plastic film or sheeting. This test allows manufacturers to determine the strength of the sample. This test complies with the following standards: ASTM D1004 Standard Test Method for Initial Tear Resistance of Plastic Film and Sheeting, WSP100.2 (INDA/EDANA) Standard Test Method for Tearing Strength of Nonwoven Fabrics by Trapezoid Procedure, and ASTM D5587 Standard Test Method for Tearing Strength of Fabrics by Trapezoid Procedure. Nelson Labs is an active member of ASTM committees. Tensile testing measures the force needed to elongate and break a sample. It is used to determine the strength and elasticity of woven or nonwoven fabrics, plastic film or sheeting, gloves, condoms, and other materials. Nelson Labs tests fabrics by the strip method (EN 29073 or ISO 9073) or the grab test (ASTM D5034, D5035). Plastics are tested according to ASTM D882, ASTM D638. Fabrics are tested wet or dry. We are an active member of ASTM committees. In the Tear Resistance test, plastic samples are cut using the ASTM D1004 die C and the average of several thickness measurements is reported. The instrument is set up with the crosshead speed to 2 inches per minute and the specimen is inserted into the grips. The maximum load in pound force for the specimen is reported. Fabric samples are cut to 3 x 6 inches. The instrument is set to 12 inches per minute and the specimen is inserted into the grips. The maximum load in pound force is reported. Thin plastic films are tested by cutting a ½ inch wide strip. Thickness is measured at three locations. The speed and grip distance vary depending on the percent elongation of the sample. Samples are pulled until break, and the breaking factor, tensile strength, tensile at break, elongation, and modulus are reported. Thicker plastics are cut with the ASTM D412 die C. Marks are made 1 inch apart and the median of three thickness measurements is used in calculating the cross-sectional area. The instrument is set up with the crosshead speed to 20 inches per minute and the specimen is inserted into the grips. The elongation of the specimen is measured between the marks with an extensometer. Fabric samples are cut to 4 x 6 inches in both the machine and cross directions. The instrument is set to 12 inches per minute and the specimen is inserted into the 1 x 1 inch grips. The sample is pulled until break, and the breaking force and elongation are measured. If you have additional questions about tear resistance and tensile testing, or would like to consult with the experts at Nelson Labs, just send us a request or call us at (801) 290-7500.